Produktinformationen "Marvin Test Solutions: MV-GX3640: FPGA PXI Card with 40 Channel ECL Buffer Module"
The Marvin Test MV-GX3640 is comprised of the MV-GX3500 FPGA card and the MV-GX3540, 40 channel ECL expansion card. 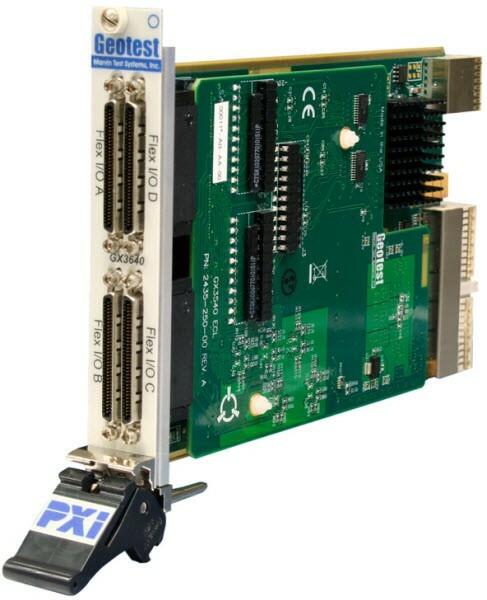 It is a 3U PXI instrument card that can be used for general data acquisition, process control, Automatic Test Equipment (ATE), and functional test applications. The MV-GX3640 consists of 20 differential ECL drivers and 20 differential ECL receivers. Each channel can be accessed via software commands for use in static I/O applications. The MV-GX3640 employs the Altera Cyclone III FPGA which can support clock rates up to 150 MHz and features over 55,000 logic elements and 2.34 Mb of memory. The design of the FPGA is done by using Altera’s free Quartus II Web Edition tool set. Once the user has compiled the FPGA design, the image can be loaded into the FPGA via the PXI bus interface or via an on-board EEROM. Reading and writing to each of the I/O channels is done via software reads and writes. The board supports standard ECL logic levels and includes on-board terminators for each differential channel. The board is supplied with 390 Î© terminators which are terminated to -5.2 volts. Optionally, the board can be configured to use terminations with an onboard -2 V termination voltage source. The terminating resistors are socketed, allowing the user to change the terminators for specific applications. The Marvin Test MV-GX3640’s FPGA device supports up to four phase lock loops for clock synthesis, clock generation and for support of the I/O interface. An on-board 80 MHz oscillator is available for use with the FGPA device or alternatively, the PXI 10 MHz clock can be used as a clock reference by the FPGA. The FPGA has access to all of the PXI bus resources including the PXI 10 MHz clock, the local bus, and the PXI triggers, allowing the user to create a custom instrument which incorporates all of the PXIbus’ resources. Control and access to the FPGA is provided via the Marvin Test MV-GX3640’s driver (GxFPGA) which includes tools for downloading the compiled FPGA code as well as providing register read and write functionality. Weiterführende Links zu "Marvin Test Solutions: MV-GX3640: FPGA PXI Card with 40 Channel ECL Buffer Module"